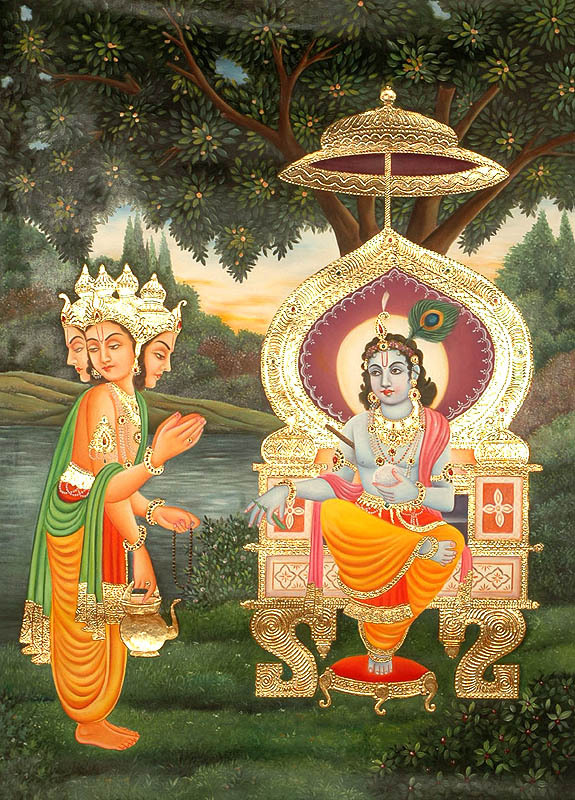 This beautiful painting composed with brilliant portraits of Krishna and four-faced Brahma illustrates the legend of an apologetic Brahma appearing before Krishna with folded hands seeking his pardon for the mischief that he had done him. The artist has retained the venue of the legend – Yamuna’s bank and adjacent forest where Krishna and his mates took their cows to graze, but has added to it a majestic throne with golden backrest and gems-studded gold umbrella. It has been raised on massive gold legs and has been provided with a footrest with velvet cushion – something unrealistic in context to the legend. It was actually after seeing Krishna in the ordinary or rather mean surroundings of a cowherd boy – seated under a tree and sporting with other poorly clad cowherd boys, that Brahma grew suspicious of Krishna’s genuineness as Vishnu’s incarnation but the artist, while retaining the spot and other things, alternated the clay-mound or rock that Krishna might have used to seat on with a majestic throne. As the episode appears in the Bhagavata Purana and other texts, one day Brahma, when passing across, saw a human being who looked like Lord Vishnu sporting with a band of cowherd boys around the bank of river Yamuna. He was none other than Krishna. However, Brahma could not concede as to why Lord Vishnu would come down to such level as to live like a low-born cowherd and graze cattle. For his satisfaction he decided to test the genuineness of this Vishnu-like looking human being. As decided, Brahma led away all cows grazing around and hid them in a secret den. Not finding their cows anywhere Krishna’s mates rushed to him and told him that their cows weren’t seen anywhere. Krishna himself went in their search but could not trace even a sign of where they had gone. Dismayed he came back to his mates but only to find that they too had now disappeared. He immediately realised that someone, and he could be none other than Brahma, was doing a trick for testing his power. Deciding to pay him in the same coin he created with his divine power all cows and cowherds in the same numbers and forms as were the real ones and with them returned to Vrindavana. About a year passed when Brahma recalled the episode. He thought that he should find out as to what happened after he had hid the cows and cowherds. He went to Yamuna’s banks where he had seen Krishna and his friends grazing their cows. To his utter surprise Brahma found the same cows grazing around and the same cowherds sporting with Krishna, though those that he had hid – the original ones, were still in his custody. He immediately realised that the man whose genuineness he tried to test was none other than Lord Vishnu who with his divine power had created identical lots of cows and cowherds for rendering his trick ineffective. Apprehending Vishnu’s displeasure for the mischief that he had done him he rushed to Krishna and apologised for it with a bowed head and folded hands. In scriptural tradition Krishna was of about five years of age when the event took place, though in the tradition of art, as here, he has been often portrayed in his youth. Again, different from the Bhagavata Purana’s version where he is an ordinary cowherd boy, in art tradition he is often painted as crowned and bejewelled but not in such majesty with an imperial throne under him as here in this painting. The flute carried under his armpit and the peacock feather fastened to his hair apart, he has been portrayed with all his lavish jewels and a gems-studded crest more like Lord Vishnu in his imperial frame rather than Krishna, a cowherd. Far stranger is Brahma’s iconography. The age-ridden grey-haired and grey-bearded tough form of Brahma, in scriptural as well as art traditions, has been alternated here in this portrayal with a vigorous youth endowed with feminine beauty and tenderness. But for his four faces and four arms and rosary and ‘kamandala’ – water-pot with spout, his characteristic attributes in them, he has been conceived more as the tradition conceives love-god Kama rather than with Brahma’s iconography. Medieval paintings illustrating the legend usually portrayed a number of cows, with or without a Brahma-like figure carrying them away; but instead, this painting lays greater emphasis on portraits of the two figures and in them it is simply outstanding.